It is interesting to watch the tourists who arrive there. The beauty is such that they get somewhat dumbfounded. What they do initially is hit the stores to dress themselves--Venice has the best boutiques in Europe--but when they emerge with all those things on, still there is an unbearable incongruity between the people, the crowd, and what's around. Because no matter how well they're dressed and how well they're endowed by nature, they lack the dignity, which is partially the dignity of decay, of that artifice around them. It makes you realize that what people can make with their hands is a lot better than they are themselves. Ever since I came across this tremendous photo, I've been on a Django Reinhardt jag (the latest one, anyway). It dates from 1946, when the Gypsy wizard made his only visit to the United States and toured with the Duke Ellington Orchestra. 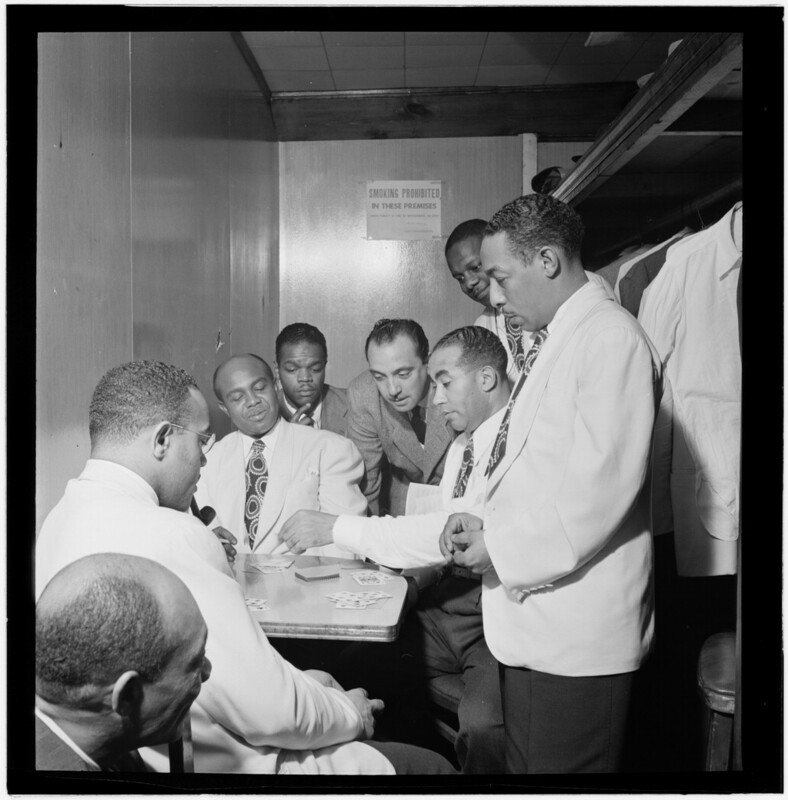 In the photo, Reinhardt watches several of the band's virtuosi play cards, while the great Johnny Hodges works on his patented expression of boredom. As a guest artist, Reinhardt wasn't obliged to don the white jacket and playful tie. Nor, supposedly, could he handle the colorful boxer shorts worn by his American colleagues. Discovering these florid undergarments during a train trip with the band, he dropped by Ellington's compartment to ask about them--and found the maestro sporting an even gaudier pair. When I asked him later for his impressions of America, Django seemed to me to have lost most of his illusions. He was far from impressed by the American mentality, above all that of the women. Even the cars no longer had their old appeal for him; they were all too much alike. The bit about the cars is particularly poignant. Clearly the Art Deco curves and chrome accents of the previous decade had turned Django's head. If he had stuck around two more years, he could have seen the sui generis 1948 Tucker Torpedo roll out of the showroom. Instead the disillusioned guitarist sailed back to France in early 1947, never to return. At the state fair in Harrisburg, Pennsylvania, he had to perform outdoors at 4:00 PM with a roller coaster running full bore behind him and circus animals being paraded around a race track between him and the audience. He was supposed to do thirty minutes, but the distractions were so extreme that he raced through his routine and bolted from the stage after ten minutes, sure that it meant the end of his career. He was consoled by a grizzled patron who told him, "Trust me, kid. Bill Cosby was here last week, and he only did fifteen minutes." Hunt was warned to approach Beard in a physical disguise with a phony ID because "we don't want you traced back to the White House." To pay for his expenses, he was handed an envelope filled with cash from Nixon's reelection campaign: his flight to Denver was booked by a White House secretary. Hunt arrived at Beard's hospital room near midnight wearing makeup and an ill-fitting reddish brown wig, his voice disguised by an electronic alteration device provided by the CIA. The not-so-covert operative looked "very eerie," Beard's son remembered, with his hairpiece on "cockeyed, like he put it on in a dark car." It is also no surprise that Fox views the century through a British lens. 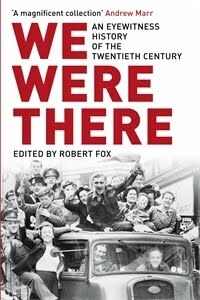 There is no need to complain about the preponderance of English voices, not when the likes of Robert Graves, Evelyn Waugh, Robert Byron, Ronald Blythe, Gertrude Bell, George Orwell, and James Fenton are in the choir. Still, it is a little strange to see Britain’s reconquest of the Falkland Islands in 1982 trotted out as a major event of the century and "the last of the British imperial wars." Why not include the American invasion of Grenada the following year, or the toppling of Manuel Noriega and his capture as part of Operation Nifty Package (really) in 1989?